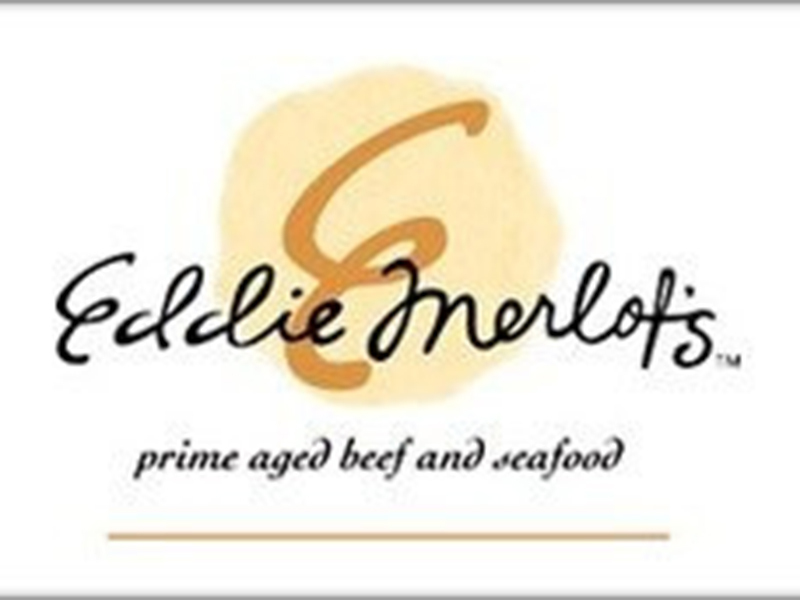 Joanne tells me that we dined at an EDDIE MERLOT’S years ago, she thought in Milwaukee. That may be so, but it had been wiped clean from my memory, so last week as I walked into a suburban Chicago branch of this chain, I felt like a first-timer. As it turns out, we had a “just fine” experience – better than the hokey name would suggest. 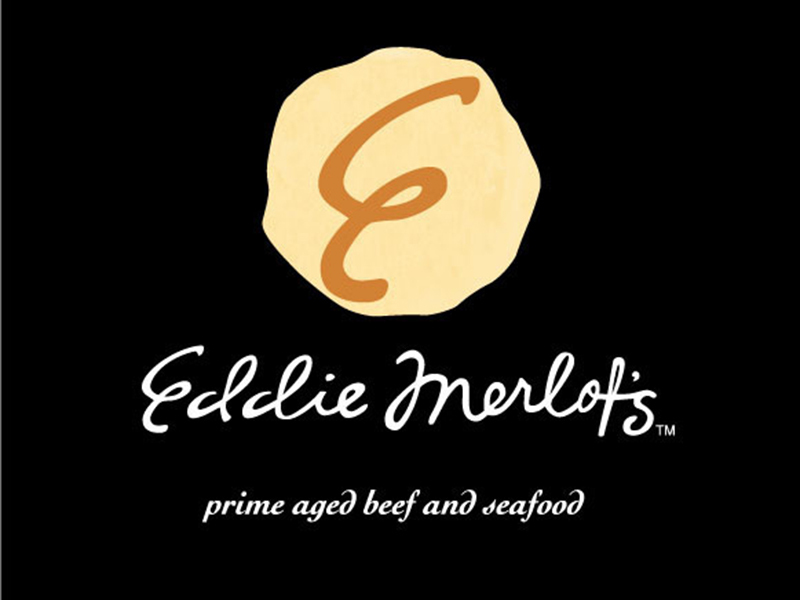 If you go to the website, you’ll see that there’s a story behind it, but to me “Eddie Merlot’s” – sorry, “Eddie Merlot’s™” – sounds contrived and soulless. And – I gotta be honest – the interior doesn’t dispel that impression. 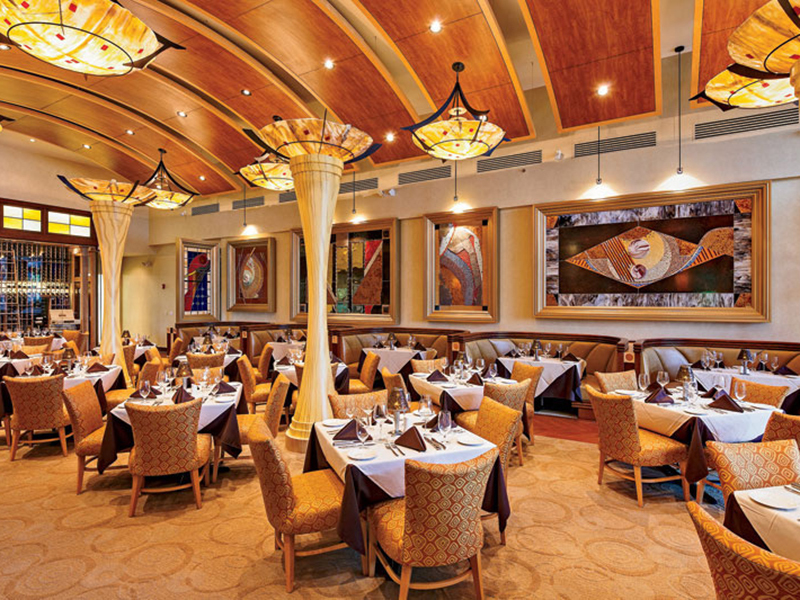 It’s polished, comfortable and….not so different from a Cheesecake Factory, with high ceilings, fanciful columns, lots of big artwork, decorated alabaster-like chandeliers, and oversized comfy chairs. 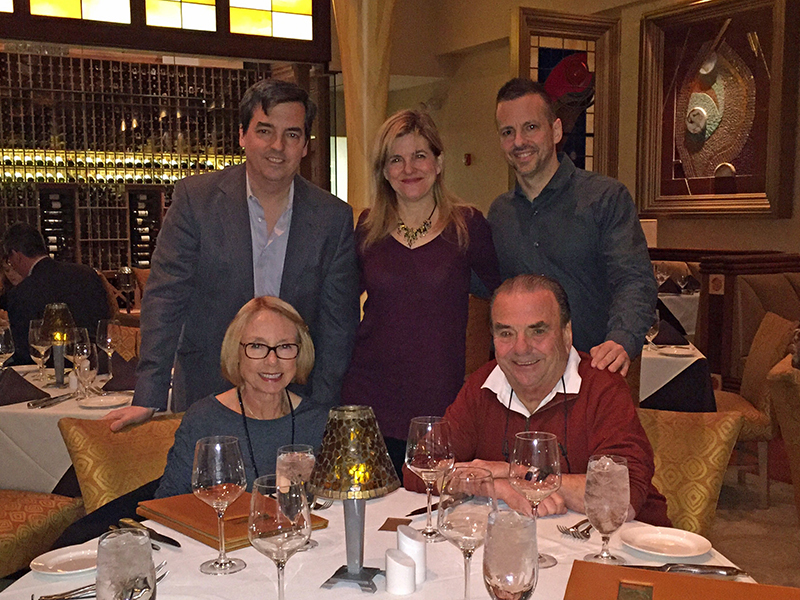 Eddie Merlot’s refers to itself as “one of America’s great steak houses,” but to me, it felt more like an upscale suburban restaurant – which, of course, is precisely what it was. 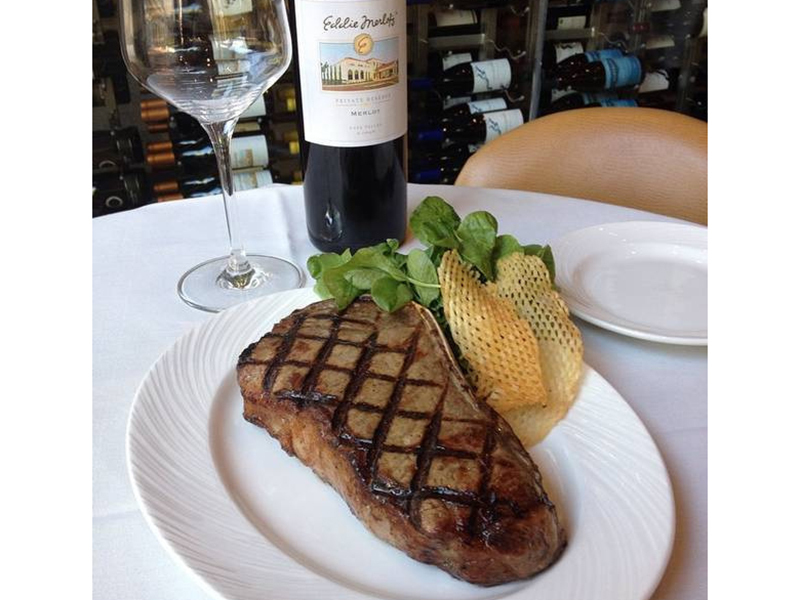 MANNY’S is a great steakhouse. ST. ELMO’S in Indianapolis, BONES in Atlanta, and PETER LUGER in New York are great steakhouses. They have an authenticity, a soul to them; their wood floors, rough-talking servers and no-nonsense attitude give them a clubby, brawny, beefy vibe that feels real because it IS real. 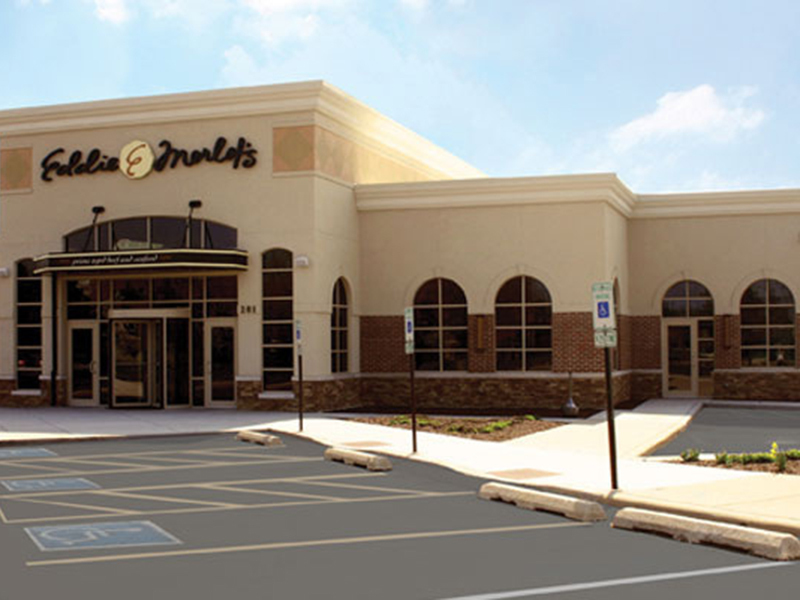 Then again, Eddie Merlot’s seems to be doing well, so WTF: What do I know? Well, I know this: The service was prompt, attentive, professional, and not at all overbearing. And the food pretty much lived up to the restaurant’s promise. The bread was crusty and warm. 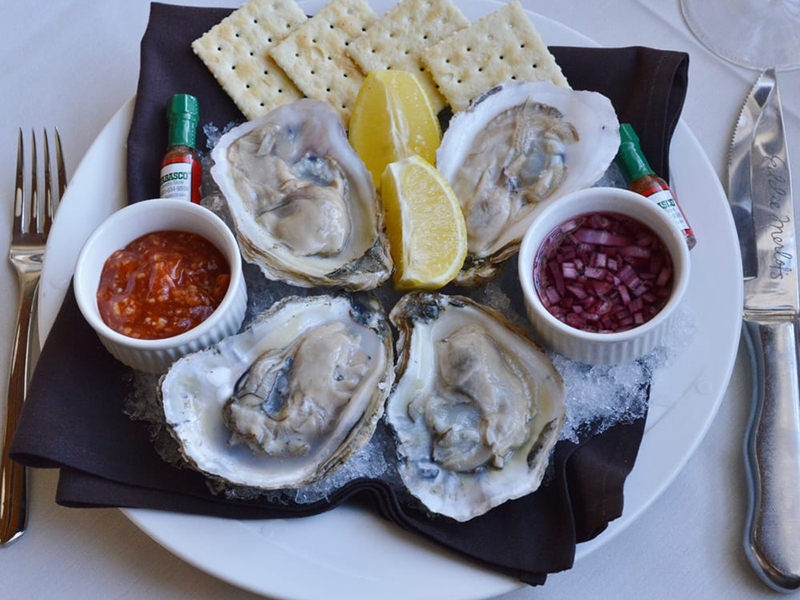 The oysters were fresh and briny. 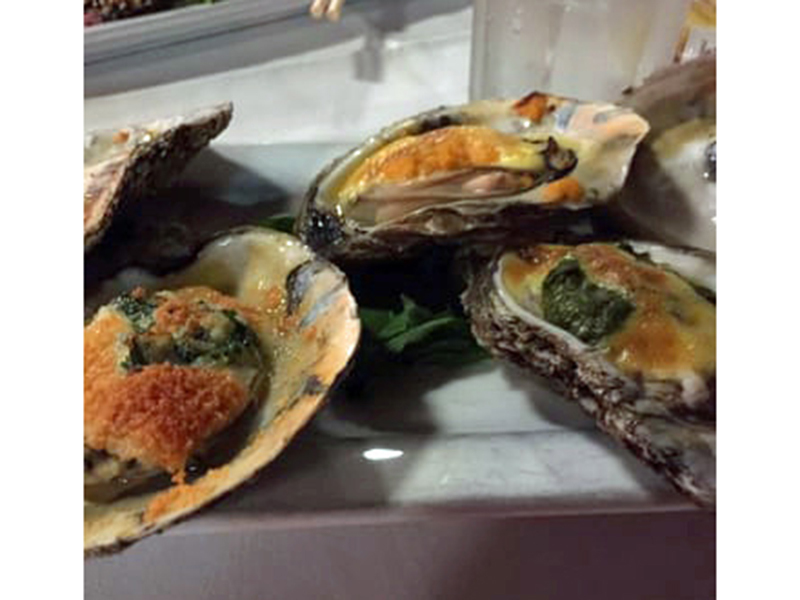 And Oysters Rockefeller were just as they should be (At $30 for six, they damned well better be good). Next came the Sesame Battered Calamari with three dipping sauces. 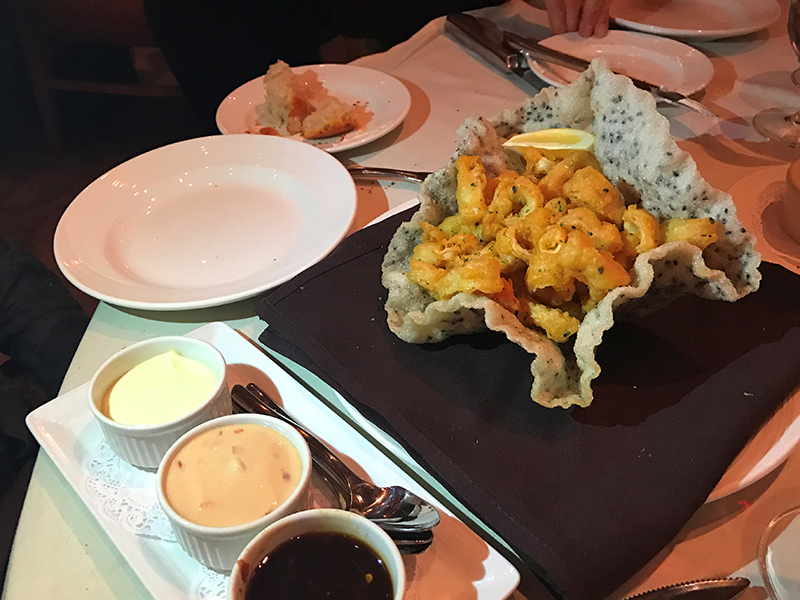 The squid was tender and not rubbery, but the best thing about this dish was the deep-fried, edible rice basket that held the calamari. 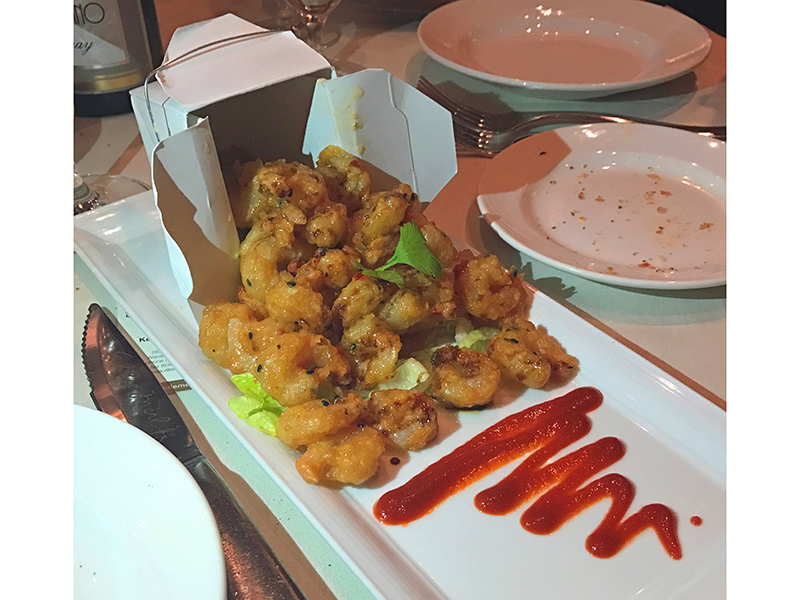 We also shared Sweet & Spicy Shrimp with an Asian dipping sauce. This appetizer arrived in a Chinese takeout container. Cute. Both it and the calamari ran $14.95. 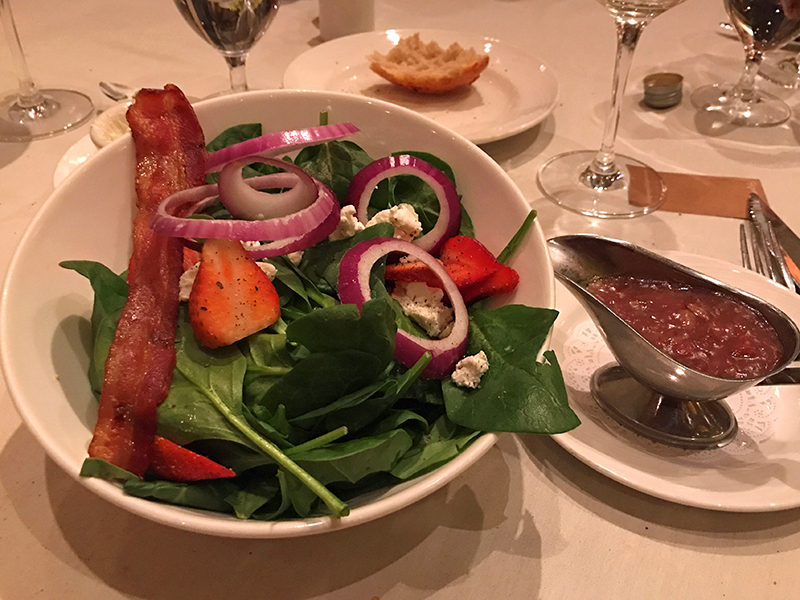 The Caesar and Spinach Salads (both $9.95) were freshly tossed, served on properly chilled plates, and not over-dressed. The main courses satisfied as well. 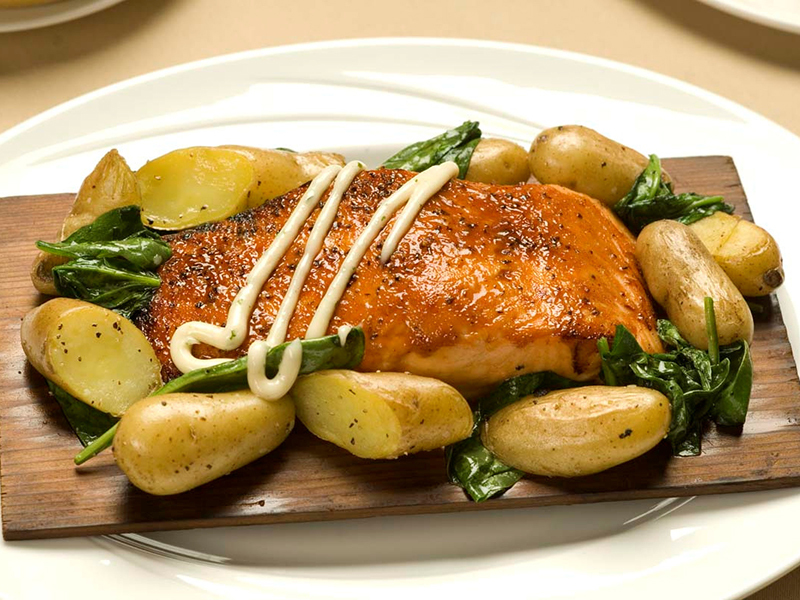 My wife and daughter had the Grilled Salmon with Gremolata and the Cedar Planked Salmon with Fingerling Potatoes, both $39. The 16 oz. 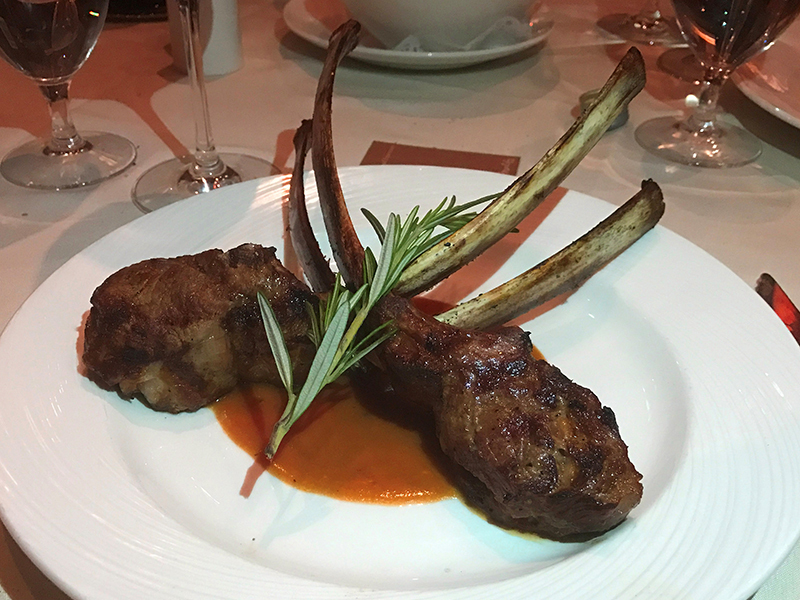 New York Strip was well-prepared and a bargain at $26.95, but the lamb chops, although well-prepared, were overpriced at $49.95 for just two chops. 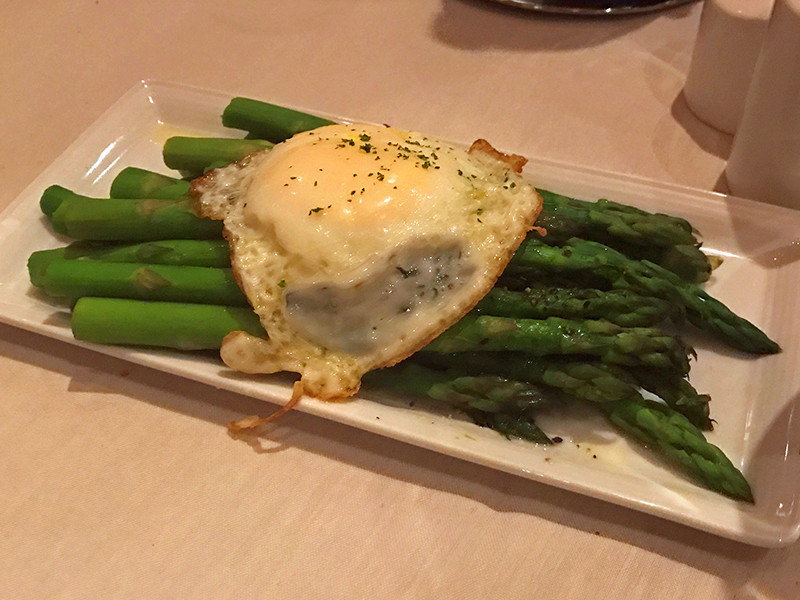 Another nice touch: the fried egg that topped our side of asparagus. 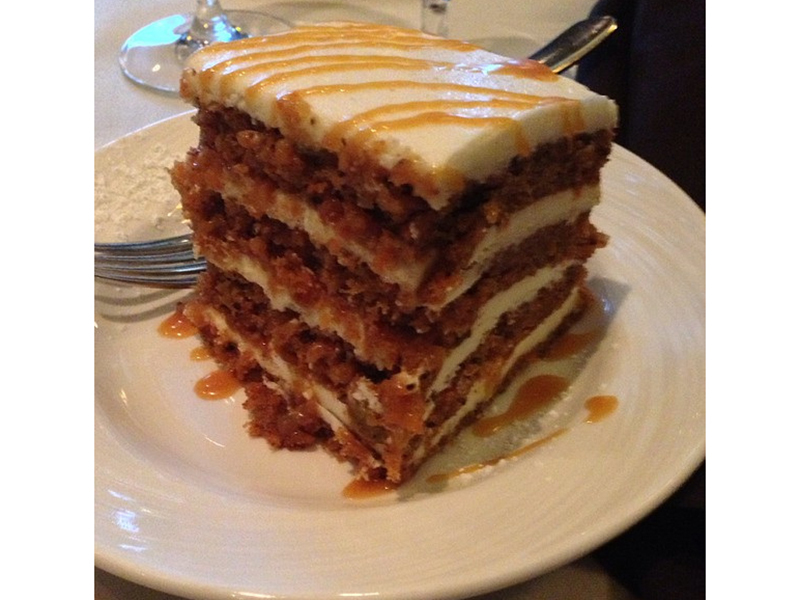 Eddie Merlot’s signature dessert is Carrot Cake, and ours lived up to its billing. 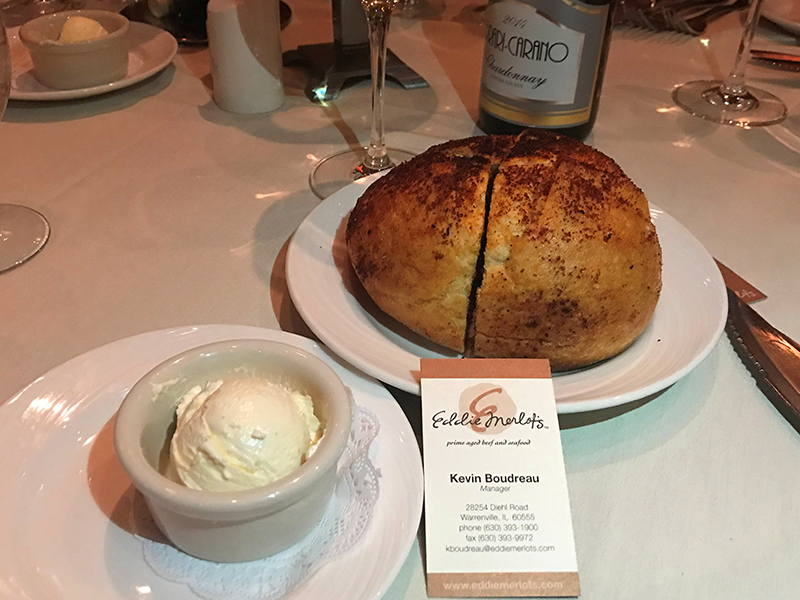 (I have no idea what the calorie count was for our sizable, melt-in-your-mouth piece, but a friend who’s involved with an Eddie Merlot competitor tells me that his restaurant’s similarly portioned carrot cake packs north of 2,000 calories!). Our dessert ran $9.95, and we ate every bite. In the industry, we classify restaurants as “casual dining” and “fine dining”, etc. but we also use the terms “destination dining” and “utility dining.” People will cross town (and sometimes the country) to eat at Manny’s. They’ll cross the street to eat at an Applebee’s. 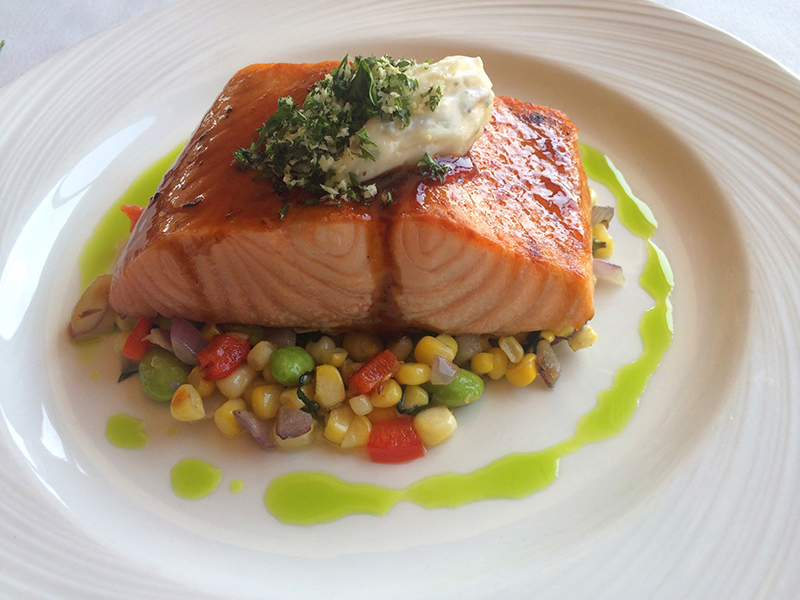 For all its comforts and quality, Eddie Merlot’s strikes me as “utility fine dining” – the place to go when you want something good, dependable and high-end, but you don’t have the time or energy to seek out the iconic local destination restaurant. 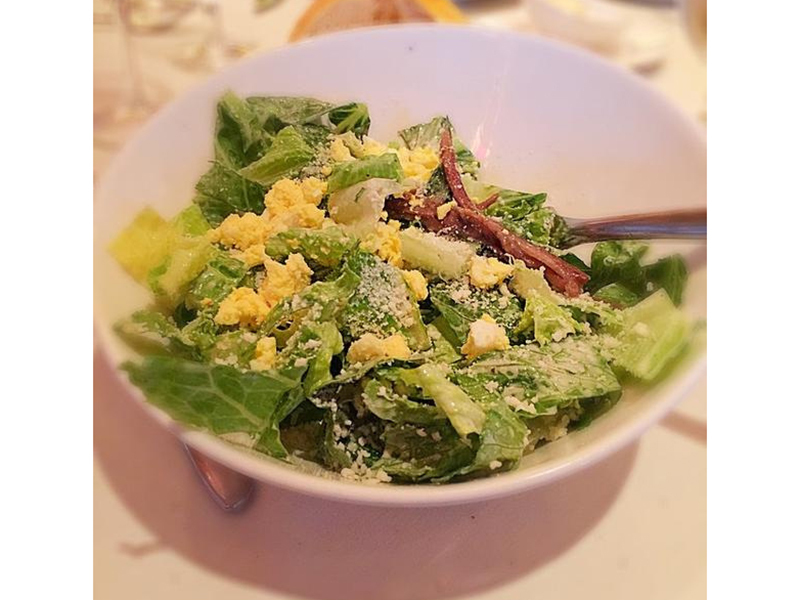 So should you give Eddie Merlot’s a try? Absolutely. Don’t expect a Peter Luger experience, but do expect a good dinner. I’ll bet the place in Milwaukee (actually Wauwatosa) was Eddie Martini’s. It was quite good, fine dining experience.